Jordan Allen is - Jordan Allen (frontman &guitar) Danny Quin (lead guitar) Nathan Howard (drums)and Kieran Loughran (bass). In a year when Bolton band Jordan Allen toured as main support to The Sherlocks, played countless gigs and festivals around the UK (including many This Feeling/Jack Rocks stages), won the Virgin radio Freshfest competition (beating thousands), sold out 8 of their 16 dates on their debut headlining tour and released their single R.O.S.I.E, (which is fast becoming THE Indie Anthem of 17), It’s All Indie (Rhona) caught the boys for a chat before they played a sold out gig at The Joiners Southampton. R - I’d like to ask you about something I saw on your social media recently about a special guest you had on stage called James. How did that come about? K- It was really nice to give him the opportunity to actually do what he wanted to do rather than being held back by anything and he’s done loads for it now, pushed it out on social media about awareness of it (Aspergers Syndrome) which is really good..
J – It’s scary that we’re in a position that we can do it and help people like James which is a good thing. J – Definitely and it was a bit of a shocker to us that and it’s only on this tour that we’ve realised the position we’re in and what comes with it. R- So that’s a double-edged sword with social media the way it is. You’re watched all the time, everything you say and do is observed and people make interpretations on it. If you do anything slightly wrong or anyone thinks you do then you’ve got trial by social media so it must be really tricky, I don’t envy you! J – Yeah you only have to look at what happened with bands recently and it’s kinda like, for us, yeah it’s more important than ever. It’s scary ‘cos we’re 4 normal lads, we’re having a laugh at a gig and stuff but you’ve got to really get your head on and be as professional as you can be. R - Difficult though isn’t it ‘cos you want to be yourselves and you want to be natural and you don’t want to have to over-think every single thing you say. You want to be able to put on your own social media that you’re having a bad day and you can’t because somebody will pick it up. N – Yeah taken out of context. R – That’s it I went to see a band recently on the day a scandal broke about them and what had allegedly happened and instantly one of their big forthcoming gigs, just a couple of days away, was cancelled. So, nobody knew what had happened and no-one had any evidence at all but it was cancelled. And that gets interpreted as “oh there must be something behind it”. J – Yeah exactly, it’s a tricky time, you’ve just got to stay as professional as possible. It’s a strange time to come through as a band, these are all factors that no-one’s ever dealt with before I don’t think so you’ve gotta learn as you go. 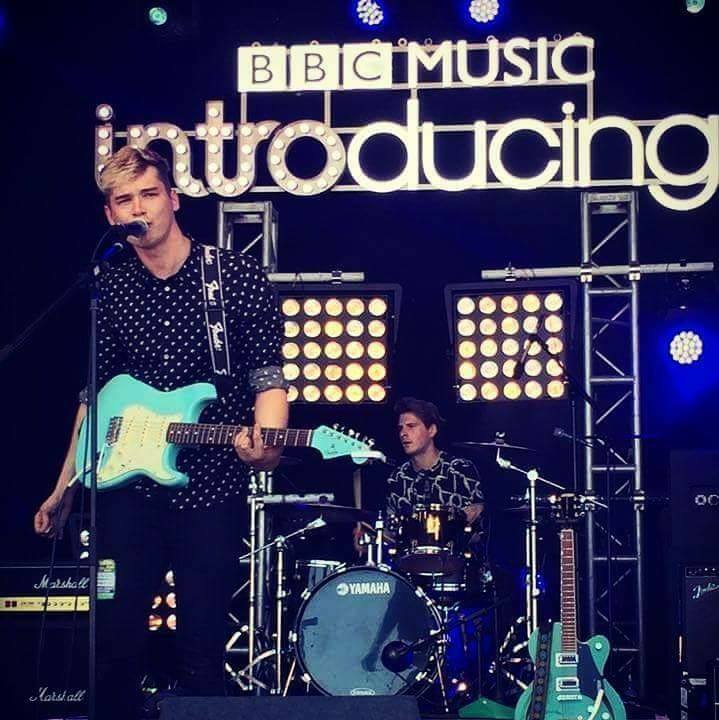 R – I went to the This Feeling Red Stripe TV recording a couple of weeks ago which had The Sherlocks headlining and Gordon Smart (Radio X) asked them to name a couple of bands that would be the next Sherlocks, the next bands to watch and they said Jordan Allen (and Yonaka). All – No way that’s brilliant, we didn’t know that, that’s news to us. R – It was a great night as well which brings me onto This Feeling, you’ve done a lot of This Feeling gigs and festivals playing the This Feeling/JD/Jack Rocks stages what do you think of This Feeling and what’s it done for you? J – When I first started even as an acoustic artist I remember the first time I emailed This Feeling and said listen I can get you 50 people to a gig in London and 50 to a gig in Liverpool and a 100 to a show in Manchester and he took me up on it and put me on all these shows and obviously I had no-one there in London and no-one there in Liverpool but I think without that and without This Feeling taking a chance on me at a lot of these shows things might have worked out different. This Feeling has provided such valuable chances just being on that circuit and meeting other bands and like. We’d never have met SHEAFS if it wasn’t for This Feeling and we’d never have met The Wholls and so many other bands we’ve gone on to be mates with and played bigger shows with. It’s such an important networking thing. R – I think This Feeling network is incredible. Whenever I go to any of the This Feeling shows in London the audience is full of other bands. A recent one was the This Feeling ‘Alive Tour’ warm-up gig with The Shimmer Band/Blackwaters and Bang Bang Romeo and in the audience there were Paves, and lots of individuals from other bands, Emily Capell was there as well, it’s like a big family. N – Emily actually came down to one of our Manchester shows, her show got cancelled in Manchester and we actually got in touch with her and said do you fancy coming down? So we invited her down and she spent the night with us and watched the gig. R – She’s amazing isn’t she? R – I spoke to her recently and asked her about SoccerSix (6 aside football event raising money for Musicians Against Homelessness). Emily’s team was against you guys and she shouted “Kiaran your hair’s a mess”! K (laughs) .. and I thought if that is all you’re thinking about that’s fine…. we’re beating you 6 nil!! R – I reminded her she’d said that and she said distraction was needed and she had to do something. D – She kept slide-tackling me even when I didn’t have the ball!! R- You were all taking it very seriously whilst Emily was skipping round the pitch. J – Yeah we were putting as many goals past them as we could, we needed to win..!! R- So what’s your favourite song to sing, what gets the best reaction? All – It’s got to be R.O.S.I.E. N- From the reaction on tour every time that song starts Jordan doesn’t even have to sing the words the interactions have been really good. R – What’s that like when people know your lyrics and sing them back to you? J - I think the first time we really noticed that people, specifically with R.O.S.I.E. were picking up on it was when we did Jimmy’s in Manchester and I played the first chord there and just wasn’t expecting it at all! The entire crowd just sang the whole song so we were stood there like… we might as well go home and it was at the point we thought actually that’s pretty special, I don’t think many bands at our level get the cult following that’s come out. The amount of variations on it we’ve had with people obsessed with the song, it’s nuts really!! ‘Helter Skelter’ still gets a really good reaction but we’ve added so much to the set now and we’ve taken a lot from other bands like SHEAFS and learnt how to interact with the crowd so we can use the songs we’ve got, and I think we’ve got some really special songs in there. I think the more we’ve gigged we’ve found how to get them across to the crowd and get them involved and get the stories across as well which I think is really important with our songs ‘cos there are stories behind every song. R – I remember talking to you when you played at this venue with The Sherlocks and I asked you about that tour and you said you’d learnt a massive amount from watching them and they had learnt a lot from you as well. K – When we went away with The Sherlocks the first time and we were like admiring them because of how much they’d achieved and seeing them watching us and seeing what we do was like quite special. J - Yes it only comes with experience, like watching these young lads here tonight (support bands) and they’re just starting out and I don’t think you clock on, when you first start it’s all a bit rabbit in the headlights and you think these bands you play with and tour with are successful and they’re just a few years down the line and have started to get a following. That’s how it works and it’s a scary thing now that we’re one of those bands, hopefully on the verge of breaking through. R – It’s been an amazing 12 months hasn’t it? K – Probably the best 12 months ever! J – I think particularly these last 2 weeks, it’s been insane and we didn’t expect it. I think Preston was a really good first night and then we went to Plymouth. When 120 people turn up, and we’ve been there once, and they’ve all bought tickets in advance and they all know every word to the songs it was like “oh my, there’s something really going on here”. But we’ve been to other gigs and it’s been quiet. The surprising thing is I thought we’d have a few gigs with literally no-one there but every gig we’ve had people there who know the words and buy t-shirts, that’s the coolest thing about it all really. J – Last year getting the Radio 1 play constantly, the constant press attention and everything else that comes with it I think it’s really difficult even for the bands that consider themselves established I was surprised even when we went with The Sherlocks and played Southend. Manchester we’d got 3000 kids there going mental and Southend there might be 30 with a massive 50 year old bloke at the front going nuts and knowing every word…, it’s hard to get the scope of that until you get there and do it. But I think if you put us in front of a crowd anywhere whether it’s 20 people who are stood at the back of a room like we had recently or 200 people then we’re confident that by the end of the gig we’ll have people on stage and that’s what we’re about. We want to get people involved and enjoying the gig. Last night, everyone was stood at the back of the room, I said it’s not a spectator sport it’s a gig, you’ve gotta get involved. D – You do at our gigs anyway! J – And that’s what we want to be about, if you can start doing that then hopefully the crowds come with you. K - Like it’s Glastonbury main stage! R - Yes, because you don’t know who’s out there. That could be the gig that changes what happens to you in the future. D – We were in a town recently playing with another band and we played to 4 people and 2 of them were the bar staff. Everything was great, the sound was great, the stage was great and we were backstage looking out and we could easily go out and do nothing but I was climbing on speakers and going mental to 4 people! Probably one of the best gigs we’ve ever played, to 4 people!! R – When you’re watching from the audience it’s so much better if it’s not just one person at the front doing something so when you (Danny) get on the drum kit or something it’s really good. D - My tambourine has been played by a lot of people… (K - and that’s not a euphemism either!). You’ll see me point at somebody and throw it. I threw it at someone in Brighton and they just moved out of the way and someone who was really keen ran over and picked it up..! R – So what’s next for Jordan Allen then, an album?? J – We’ve got to think about it next year, we’ve got 2 tracks recorded and we’ve got one that’s demoed that we’re really excited about, we’re not playing it yet on this tour, we finished the demo a couple of days before we came away and we’re really excited about that. The 2 we’ve got recorded are ‘Wasted Generation’ and ‘Out Of My Mind’. We didn’t expect the reaction we’ve got from this tour so now we’ve got to go back and go right well this is what we’ve got to do next. I think probably ‘Wasted Generation’ will be the next single in some capacity but then we’ve got to starting planning for an album and which ones we’re gonna keep back for an album and which we’re not and if we’re gonna push any new stuff through. We’ve got such a backlog of material now, probably about 2 albums worth, it’s what we keep and what we get rid of! R- That’s a nice position to be in though isn’t it? D – Yeah there are some songs we used to play when I was first in the band and we had a full set of songs, we had like 12 or 13 songs and now we’ve only got one of those songs in the set! K – Even from when I started the set’s changed. J – There are songs that have been in and out. We had this conversation with SHEAFS the other week and they’ve got rid of the song ‘Nobody’s Watching’ which was their biggest tune (K – my favourite) J - and in my top 5 played in Spotify this year and it’s not in their set anymore and I was like what’s your thinking! They said we want to move on, we don’t want to sound like that anymore so I think that’s important ‘cos you’ve got to really define yourself. It’s like any other business you’ve got to differentiate and got to have your own sound. For us, the first time we played Manchester’s Albert Hall with The Sherlocks and our big tune was ‘Remembered’ which was probably before you knew us and our manager told us to drop it. This was our biggest gig ever and he told us to drop our biggest song and we said … D – are you mad?? J – But we did and we played the set and he was bang on ‘cos your sound’s got to move on, that’s so important, particularly now ‘cos people do get bored quickly. R – I find that! Because I see the same bands over and over again, to be honest if they’ve got the same set list they had 12 months ago I tune out a little bit. It doesn’t matter how much you like them you need something a bit different and I think that’s difficult when bands tour all the time and don’t get the time to write new material. And so reluctantly I let the band go and get ready to play. They took the roof off at The Joiners and did the same at their last 3 tour dates in London, Manchester and Liverpool. 2018 is sure to be mega for Jordan Allen and I for one can’t wait! The single and video for R.O.S.I.E are out now.